looks like quite a beast! Curious if BP can handle (or tame) it when drilling later this year. According to MarineTraffic the rig left Korea this weekend, but will still have a stopover in Singapore apparently. Tightening the last bolts, I guess. Hyundai Heavy Industries (HHI) has delivered Ocean GreatWhite, the world’s largest semi-submersible drilling rig, to Diamond Offshore, a Houston-based drilling contractor. Ocean GreatWhite, measuring 123 meters (402 feet) in length and 78 meters (255 feet) in width, is capable of operating in waters up to three kilometers (10,000 feet) deep and drilling down to a depth of 10 kilometers (6.6 miles) from the sea surface. It has an operating draft of 23 meters (77 feet) and a transit speed of about eight knots. The rig will be chartered to BP for operation in the Great Australian Bight from October this year. Diamond Offshore has a fleet of 30 drilling rigs, consists of 21 semi-submersibles, four dynamically positioned drillships and five jack-ups. The Ocean BlackHawk was delivered in mid-2014, and sister rigs, the Ocean BlackHornet, Ocean BlackRhino, were delivered at the end of 2014. 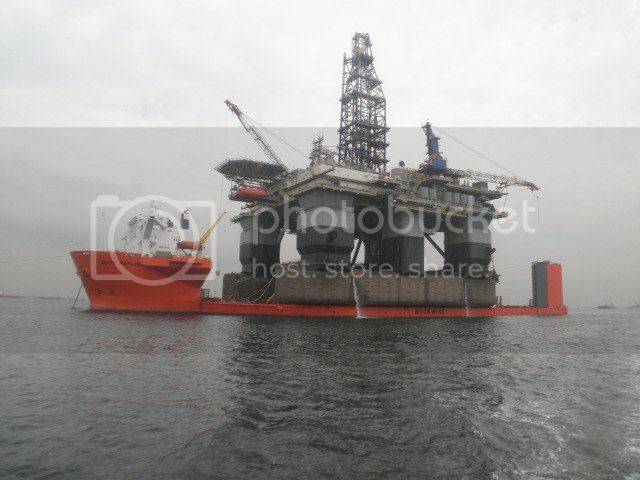 The fourth newbuild drillship, the Ocean BlackLion, was delivered in the second quarter of 2015. The company also has two deepwater semi-submersible rigs, named Ocean Apex and Ocean Onyx, which were delivered in 2014. HHI won the order worth $630 million to build the Ocean GreatWhite in 2013 and has delivered four other drillships to the US-based drilling contractor so far. The delivery installment worth 460 billion won ($395 million) HHI received from the client will help improve HHI’s cash flow. Korea’s top three shipbuilders, HHI, Daewoo Shipbuilding and Marine Engineering and Samsung Heavy Industries, lost more than $7 billion between them last year and have secured few orders in 2016. Yes, quite common for rigs, drillships and other large offshore vessel to make a stopover in Singapore to install aditional equipment and do some modifications and/or fine tuning, before heading for their first job. Apparently it is expensive/difficult to get these things done at the building yards, especially for standard designed units. PS> Hopefully this big monster will be able to handle the long swells in the Great Bight. The natural frequency of some large semies happen to coincide with the prevailing wave frequency in that area, causing excessive heave. Well known now, so BP have probably done their homework. [QUOTE=ombugge;187426]PS> Hopefully this big monster will be able to handle the long swells in the Great Bight. The natural frequency of some large semies happen to coincide with the prevailing wave frequency in that area, causing excessive heave. Having a second look I see now the rig is sailing to Singapore without assistance or towing, just on its own propulsion. It might already be a first test to see how ‘seaworthy’ it is and if it can deal with wavy conditions. Can’t imagine they’ll be doing the whole trip to the Bight like this though, way too risky & time-consuming. All the newer Semis are able to sail long distances under own power. Having 8 thrusters, w/6 Generators in two fully redundant Generator Rooms and 2 Switchboard/Power Management Systems, as required to obtain DP 3 Class. They are a lot safer than any single tug. Many have sailed from Korea to Europe, or Brasil, via Cape in the winter unassisted. The difference in speed between sailing independent and tug assisted is very little, if any. The alternative is to load them on a Heavy Lift Vessel, which save fuel and shorten transit time, but limit the possibility to carry out work during the passage. It also involve removing and re-installing the thrusters. The problem in the Great Bight is the long frequency of the swells, not the height of the wind driven waves. Most Semis has a natural frequency that is >18-20 Sec. When the swell gets to the same frequency the heave is amplified. [QUOTE=ombugge;187446]All the newer Semis are able to sail long distances under own power. Having 8 thrusters, w/6 Generators in two fully redundant Generator Rooms and 2 Switchboard/Power Management Systems, as required to obtain DP 3 Class. They are a lot safer than any single tug. Initially I was going to disagree on the HLV and thruster issue as I had some memory that the biggest one (Dockwise Vanguard) is able to load a semisub and they can leave on the thrusters for the journey. But then checking the footage of the journey of the St Malo platform on that same Heavy Lift in 2013 seems to show the rig but no thrusters to be spotted. Unless they’re retractable ones but guess not. Jack is a TLP correct? No thrusters at all. christ, it is indeed! Totally overlooked that, thanks for pointing it out. is able to “dive” to 16 m. above deck, which allow most Semis to be floated across the deck with the thrusters installed, but they can only be carried transversely if the distance between thrusters are sufficient to do so. Not ideal. Thanks for the clarification, mate. 40 years in the business … respect! Does BP actually have permission to drill there yet? We sailed both a Semi and Drillship from Korea to Brazil for my employer Ventura Petroleo. We were getting about 10 knots with the drillship in good weather and about half that with the semi. Most of the complaints by management were about consumption of fuel during the transit. The Drillship stopped off in Durban for a crew change and fuel up while the Semi stopped over in Mauritius. But in Australia, where regulators appear set to approve BP’s environmental plan– key parts of which are not available to the public – to drill in the middle of a commonwealth marine reserve, the regulator couldn’t point to any action it had taken to protect against potentially massive underwater oil spills caused by the bolt failures. BP has already had its environmental plans rejected twice by Nopsema but the documents have not been released, so the reasons for rejection are unknown. Around the world since 2003 [U]enormous bolts that secure offshore oil equipment to the seafloor[/U] have been snapping in half or coming loose, with US regulators describing the problem as a “very critical safety issue” and working with industry to replace more than 10,000 of the bolts in US waters. Which bolts are we talking about? If certified fault free bolts are available to change out 10000 bolts in the US it should be possible to get a few shipped to Australia for this one rig at least. Sound like an inspection and maintenance problem as much as metallurgy. Possibly from fatigue? If all risk can be reduced to Minuscule, who need insurance? [QUOTE=ombugge;190212]Which bolts are we talking about? time will tell whether their brand new rig is (or will be) subject to this ‘critical safety issue’. Given they already seem to have stability issues to sort out (in Singapore now by Keppel), another setback is not helpful for the start of their upcoming drilling program. uh, wasn’t that a brand new rig?! If this continues they can just keep it in Singapore for another year. [QUOTE=Drill Bill;190900]uh, wasn’t that a brand new rig?! Thrusters are removed to be able to bring the rig alongside at Keppel FELS Pioneer Yard (or any other yard) This is standard procedure for all Semies and Drill ships with the thrusters sticking down under the hull(s) and a routine operation, made a little more difficult now since Jurong West Anchorage is no longer available. Strong current limits dive time at the other anchorages with sufficient water depth to perform this task. As to getting their Environmental Plan through NOPSEMA and everything else approved by AMSA and whoever else is involved, is not going to be easy. I’m sure they will have scraped every barnacle off the hulls before leaving Singapore and will be washing away any bird sh*t that may have landed on the rig before arrival. Hopefully there aren’t any breading ground for turtles with light sensitivity in the GAB? [QUOTE=ombugge;190902]Thrusters are removed to be able to bring the rig alongside at Keppel FELS Pioneer Yard (or any other yard) This is standard procedure for all Semies and Drill ships with the thrusters sticking down under the hull(s) and a routine operation, made a little more difficult now since Jurong West Anchorage is no longer available. Strong current limits dive time at the other anchorages with sufficient water depth to perform this task. Yes, of course that how it mostly goes. It’s just that in this case I saw that the Diamond rig isn’t really at or alongside a yard; it seems to be drifting (probably anchored) just west off the Sembcorp Marine Tuas yard with some tugs around (at least according to MarineTraffic). Which made think it was maybe already some maintenance (or replacement) of those thrusters.